Nurses across Israel went on strike Wednesday to protest violence against medical staff after a nurse was stabbed by a patient on Monday. Nurses walked out of hospitals, clinics, and Tipat Halav child health centers. School nurses also joined the walkout. Esti Ayalon Kovo, the daughter of the nurse injured in the attack, spoke on Wednesday about the need for action. “Cases such as this should not happen again, and decision-makers must understand that they have an equally important role — to create a culture with zero tolerance for violence. Something has to change,” said Ayalon Kovo. “She was attacked by a patient who wanted to be hospitalized again. He did not single her out — he hurt her because he was frustrated, because he was angry. I cannot understand it,” she added. 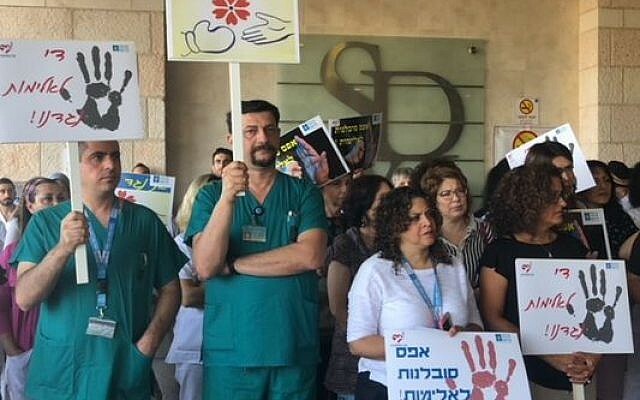 Dozens of nurses, medical staff and administrative workers went on strike at Jerusalem’s Hadassah Ein Kerem Hospital, whose director, Prof. Yoram Weiss, addressed the protesters, before calling for 30 seconds of silence in solidarity. “All of us — nurses, workers and doctors — all represented here, swore an oath to take care of every human being. But when that person harms us, we have to demand that the state do everything it can to protect us,” he said. According to a December 2017 report issued by the Health Ministry committee examining the issue, there are more than 3,000 incidents of violence against medical personnel per year, with only 11 percent of them reported to police. Only a small portion of that 11% are ever brought to trial. The chair of the Israel Nurses Union, Ilana Cohen, said the strike was a call for action after authorities failed to deal with the escalating problem. “For years we have been constantly warning about the violence, and year after year the violence is increasing,” she told the Ynet news site. “We thought that things would change after the murder of Tova Kararo last year, but that did not happen. Patients continue to threaten and harm nurses. In March last year, 78-year-old Asher Faraj doused his local HMO clinic in the city of Holon with flammable liquid and set it alight, killing Kararo. Nofar Kararo Aslan, Kararo’s daughter, gave birth to a son yesterday. On Monday a 65-year-old nurse was left in moderate but stable condition after she was stabbed at the Shmuel Harofe Hospital in the central Israel town of Beer Yaakov. The suspect, an asylum-seeker from Eritrea in his thirties who was a patient at the hospital, was arrested and taken in for questioning by police. According to a report by Channel 10 TV news on Tuesday, security camera footage of the attack showed a security guard fleeing from the scene when the attacker drew his knife. “We are committed to the safety and security of treatment staff, and we will work with the police and the Public Security Ministry to ensure that such cases do not recur,” said Deputy Health Minister Yaakov Litzman, the most senior official in the ministry. The attack came a day after a woman was sentenced to five months of community service for assaulting hospital security staff and others last September.